There’s nothing like getting to the approximate middle of winter in the Pacific Northwest to make you long for a sight of the sun. And by all accounts, this is a characteristic the Pacific Northwest has in common with London. Nothing sounds better, frankly, than getting away from the gloom for a while and into some warm sunshine. 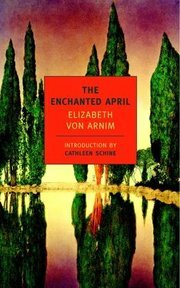 But in lieu of the Mediterranean vacation currently outside the reach of my budget, and perhaps yours, too, I suggest that you might cast an eye over Elizabeth Von Arnim’s The Enchanted April, and be really glad in the end that you did. It is just such a fortuitous glance that opens Von Arnim’s tale, when Mrs. Wilkins, taking shelter from the “sooty rain” in her club one afternoon in Hampstead, casts her eye over the newspaper and sees an advertisement for a medieval castle, wisteria, and sunshine, available for rent for the month of April. Even if it’s not gray from where you sit currently, that has to sound like a good idea. Timid Mrs. Wilkins is so taken with this vision of an April spent in a medieval Italian castle among wisteria and sunshine that she approaches a stranger, one Mrs. Arbuthnot, at her club and broaches the idea of splitting the cost, and the castle: the two of them, getting away from their lives in London, from the gloom and the gray, from their husbands and responsibilities, for a beautiful month. Due to the cost of the trip, Mrs. Wilkins and Mrs. Arbuthnot are joined by a crotchety elderly widow named Mrs. Fisher and the young and very beautiful Lady Caroline Dester. And so four unhappy women set off to spend a month in something like an earthly paradise, each in her own way looking for something to be found at sunny San Salvatore. A book about four unhappy Englishwomen taking a vacation together may sound unappealing, but let me assure you that it makes for some amount of humor not entirely unlike a Barbara Pym novel. All the radiance of April in Italy lay gathered together at her feet. The sun poured in on her. The sea lay asleep in it, hardly stirring. Across the bay the lovely mountains, exquisitely different in colour, were asleep too in the light; and underneath her window, at the bottom of the flower-starred grass slope from which the wall of the castle rose up, was a great cypress, cutting through the delicate blues and violets and rose-colours of the mountains and the sea like a great black sword. She stared. Such beauty; and she there to see it. Such beauty; and she alive to feel it. But mostly this book is about happiness; about how we interact with each other; the things we hang onto, and the things we should let go of. A book about giving, and forgiving. Making it suitable, really, for all times and seasons, not just when I might most need reminding. This entry was posted in Books, Reviews, and Reading and tagged books, Elizabeth Von Arnim, The Enchanted April on February 4, 2013 by ms.grammarian.